Promotional umbrellas are totally customized made from polyester & nylon fabrics and are also known as unisex umbrellas. They are light in weight and very effective to protect against harsh ultraviolet sun rays. The sizes offered are 21’, 23’, 24.5’ with strong stitching, light in weight, fine-finish for protection against rain and sun. They are also known as promo, advertising, jumbo and wooden umbrellas. Ladies umbrellas also known as printed, feminine, floral, ladies two-fold, satin printed and pongee printed umbrellas. The captivating beauty of these umbrellas with attractive floral designs and patterns render a feminine look. Folding umbrella can be customised as per client’s requirements and the range includes automatic folding umbrellas, manual folding umbrellas, two-fold umbrellas and three-fold umbrellas. We also provide same colour plastic handles to match the umbrella and the customization on the handle is also possible to give silent brand visibility when the umbrella is not in use. Auto open folding umbrella with 8 panels and 21 inches radius with plastic handle can be made in any colour with branding on the required number of panels. Three-fold umbrellas: – are easy to carry, with impressive look, compact in size and can be carried in recipient’s purse apart from walking advertisement for you. The standard size is 21.5” x 8 panels with heavy duty shaft. Single fold golf umbrella is in round shape with 29” x 8 panels with metal frame and wooden handle. Also, possible with auto open facility in both polyester and nylon fabric. Fibre windproof golf umbrella is available in both manual and auto open with heavy duty fibre ribs specially designed for heavy rainfalls. High quality manual and auto open windproof garden and beach umbrella known for their eye appealing designs, excellent workmanship, durability with portability available in larger sizes of 36”, 40”, 42” and 48”. 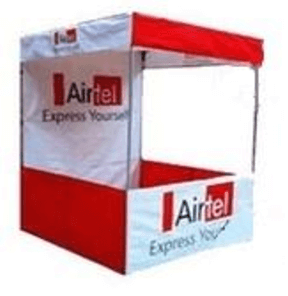 Advertisement umbrella is the best option for outdoor promotion of both your brand and products in cost effective manner while providing added utility of protection under the sun. Road shows umbrellas are used for the events, promotions and other road activities and possible sizes are 6 feet, 7 feet and 8 feet diameters. Square umbrellas: – is available in square shape in mono colour cloth with J shape wooden handle and rod in wood in size 23” with 8 ribs. Also, you can decide your choice of colours with metal frame and wooden handles. Square garden umbrella is available in varied sizes in polyester, nylon and pongee cloth with screen and digital printing options. Kiosks: – Kiosks are the best way to temporarily create a platform for your brand to promote all your products and services for mass awareness. The overall kiosk size can be as per your actual requirement within your budget with your branding at the back side, three front sides at the top and bottom as per your house colour for maximum mileage. 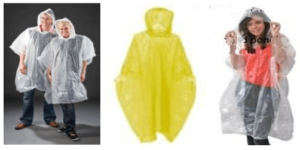 Ponchos: – Reusable unisex emergency ponchos in PE fabric material which is lightweight is available in choice of common colours in size 127 cm x 103 cm and fits all. Please do write to us for your specific customized requirements. Thank You in Advance!